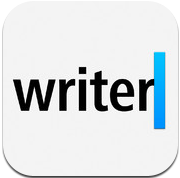 iA Writer is one of the best text editor and pure writing apps for the iPad. An app that is all about helping you focus on writing, and making things easier for you while you’re writing. It’s one of our selections for the Best iPad Apps of 2012. The app has been updated recently, to version 1.9. One of the major changes in this update is localization for Chinese, English, French, German, Italian, Japanese, Portuguese, Russian, and Spanish. Another notable addition is an improved keyboard bar. The additional keyboard row, which offers a number of useful keys for commonly used special characters, has always been one of the nice features of iA Writer. Now this bar has added arrows to quickly move to the beginning and end of words. As always, these improvements to an already stellar app are good to see.